Wow, how can I adequately get across my absolute adoration for this book? I went into this title not thinking much about it, just knowing I needed to read it because it had been on my Netgalley shelf for quite some time, and then bam my first 5 star read of the year! There truly isn’t anything I can say I didn’t like about this novel. The story does take you on a wild ride that does feel absolutely insane at times, but knowing what I know about so many cults, who’s to say this kind of thing doesn’t happen in the back-ends of nowhere? I’m completely astounded by how cults come about and the dedication people have to them, it’s amazing how some people are so susceptible to believe in something so many others don’t and I loved how that was represented in this novel. The cult element of this story really sold me into requesting this book and it did not disappoint! One of my favourite things about this novel was how the location, Coulee County, was a character within itself. The Georgia setting was as much a part of the plotline as any of the human characters, it was magnificent. I think it’s fair to say I’ve fallen in love with this gritty, Deep South setting and I will be seeking out more books like this. (A couple of years ago I read Savage Reckoning – 4 stars – and I loved that for its similar vibe)! The (human) characters in this story were superb and it was interesting getting to know each and every one of them. Our MC Earl Marcus is a troubled, lone-wolf, and rugged middle-aged man with steel fists and a heart of gold. I absolutely fell in love with him and can’t wait to read about his escapades in book 2. The love interest in this novel is Mary, who again, I loved. She never backed down from a fight and was a woman who knew exactly what she wanted, but at the same time, she was timid and loving enough to be as endearing as she was fierce. Then there was a great mix of menacing characters like Choirboy, Shaw and Earl’s father. Early is a master at creating these intense and detestable people. All the way through I hated these awful men and I was filled with so much rage at their actions. 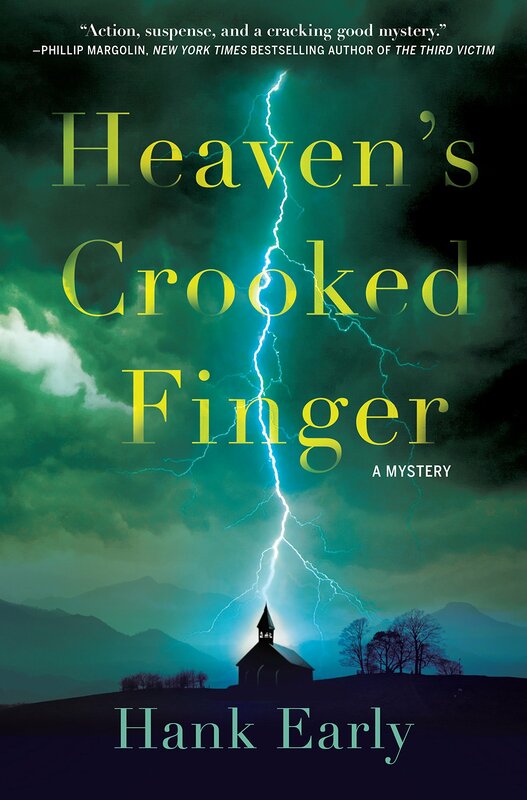 There is a never a dull moment in Heaven’s Crooked Finger as there were just so many mysteries to follow. Is Earl’s father really dead? What happened to Bryant McCauley? What happened with Maggie when she and Earl were younger? Why are so many young women disappearing? There are so many questions that need to be answered in this story and it’s exciting to follow each one of these paths. I wasn’t sure where some of them were going to go, so it was fun to try and work out the mysteries alongside Earl Marcus. The atmosphere in this book was unlike anything I’ve read in a long, long time. In fact, this whole book was unlike anything I’ve read in a long, long time. I absolutely adored it! The writing was superb, the characters were really well done and the story was enthralling. I cannot wait to get my hands on book 2, In the Valley of the Devil, which came out in the middle of 2018. Thanks so much to Crooked Lane Books and Netgalley for giving me the opportunity to read this book in exchange for an honest review. Haven’t seen this book before, but love the sound of the setting & atmosphere. I didn’t enjoy this one but maybe I read it at a bad moment lol It surely looked great!